Taking readers deep inside the high-rolling underworld of Russia's exiled oligarchs, award-winning journalist Heidi Blake illuminates Putin's alarming assassination campaign and the West's shocking attempts to cover them up. In 2014, Scot Young plummeted from the window of his London penthouse. Despite his repeated warnings to friends, family, and the police that he was being tailed by a Russian hit-squad, and the deaths of his eight associates, British police declared Young's fall a suicide and closed the case within minutes of arriving on the scene. For years, Young was a high-rolling British fixer for a ring of exiled Russian oligarchs, most notably Boris Berezovsky, who had extensive organized crime connections and came to the UK tailed by teams of Russian spies deployed to track their every move. Public enemies of Putin, these emigres extracted enormous wealth from Russia and openly criticized Putin's regime, using their power and influence abroad to raise questions about an emboldened FSB. As tensions rose, however, bodies began to mysteriously pile up, yet any British investigations were notably subdued and quickly shut down. 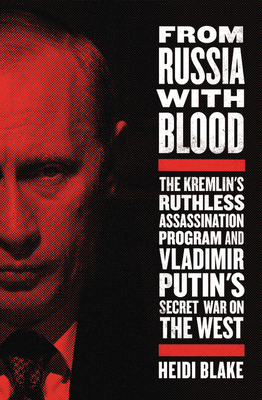 Based on 250 boxes of documents, years of reporting, and interviews with hundreds of associates, From Russia With Blood tells one of the most important geopolitical stories of our time, revealing how the death of Berezovsky, Young, and countless others can be linked to Putin's larger assassination program-and how Western governments are failing to protect those living abroad against the threat. Heidi Blake is Buzzfeed's Global Investigations Editor, overseeing a multi-award winning team of reporters. She was previously Assistant Editor of The Sunday Times, the co-author of The Ugly Game, and has won 18 national and international media awards including Scoop of the Year, Investigation of the Year, and the Paul Foot Award for Campaigning and Investigative Journalism. She was named Digital Journalist of 2016 by the London Press Club and ranked on the 2016 Forbes 30 Under 30 list of the most influential young media professionals in Europe.